Somerville, MA, September 21, 2015 --(PR.com)-- Bantam Cider has officially announced the launch of its can program. In stores this week, craft cider fans in Massachusetts and Rhode Island will be the first to get their hands on cans of all three of Bantam’s year-round ciders: Rojo, Wunderkind, and The Americain. 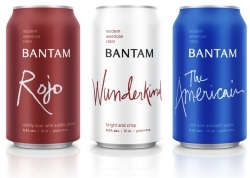 Earlier this year, Bantam Cider introduced The Americain in cans. The reception was so positive that co-founders Michelle da Silva and Dana Masterpolo were convinced that the time was right to expand the offer to its full lineup. Da Silva and Masterpolo teamed up with Brooklyn-based John Magnifico of Magnifico Design to develop the sleek, stylish can. Massachusetts and Rhode Island residents won’t be the only ones to enjoy the new cans, though. Bantam Cider will be rolling out the program to its other New England markets, including Maine, New Hampshire and Connecticut, over the coming months. That means that craft drinkers can very soon expect to find their favorite Bantam Cider in whatever packaging they prefer at bars, restaurants, liquor stores, and package stores throughout the states. Bantam Cider Company has grown to become one of New England’s most highly regarded craft cideries. The company opened in 2012 to create unique and distinctive craft ciders, which are now distributed in 5 states across New England. The cidery, located in Somerville, Massachusetts, offers tours and tastings. For more information, visit www.bantamcider.com, bantamcider.com/facebook, or follow the company on Twitter and Instagram @BantamCider. Magnifico is a brand and web design studio located in Brooklyn, NY. Led by creative director, John Magnifico, the studio specializes in designing brands and web experiences for a wide range of clients. We work collaboratively with our clients and other like-minded creative agencies to design and execute beautiful and meaningful brand and digital experiences. Our design expertise is rooted in our artistic sensibilities and a mindful appreciation for how we as humans, experience the world around us.